Squeeze zucchini with paper towels to remove excess moisture. In large bowl, stir together zucchini, potatoes, onion, flour, egg, salt and pepper until well blended. In 12-inch skillet, heat 1/4 inch oil over medium-high heat. For each pancake, drop heaping tablespoon of batter into hot oil; flatten slightly. Cook about 2 minutes or until golden brown and edges are bubbly. Turn and cook other side until golden brown. Drain on paper towels. Serve pancakes warm. Garnish with sour cream and chives. 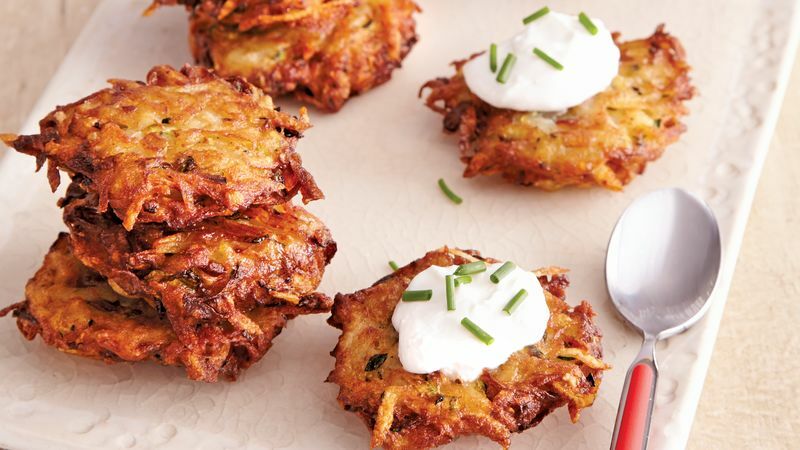 Potato pancakes are often served with applesauce, but sour cream works well with this blend of zucchini and potatoes.